There are only a few ways in and out of Death Valley, and that means there are only a handful of communities surrounding the park, offering services to travelers. Death Valley Junction is one of those tiny towns. 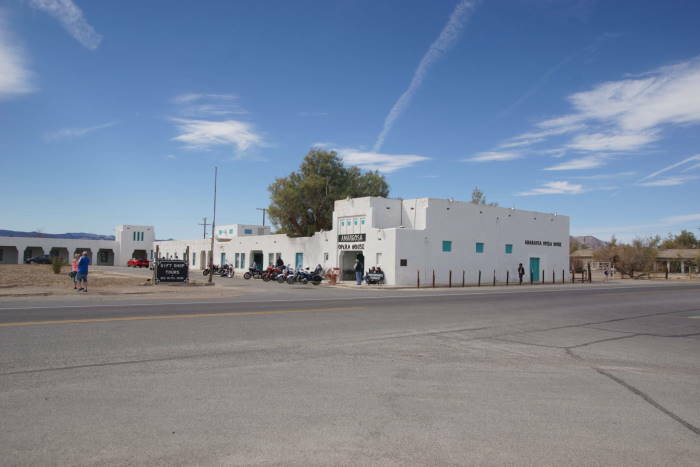 And while it’s worth stopping here as you pass through the area (specifically, to see the quirky and interesting Amargosa Opera House), you won’t find a lot of reasons to make it your base of operations. 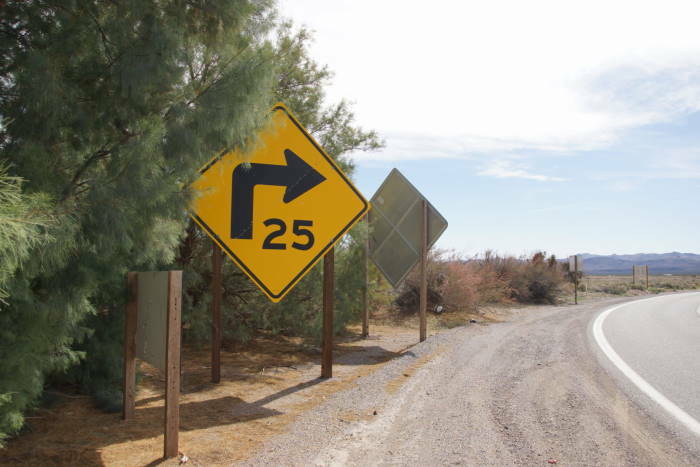 Death Valley Junction is located at the eastern end of California Route 190, at the junction of Route 127 — which will take you south to Baker, or north to US 95 in Nevada. It would be easy to stop in Death Valley Junction, look around for a bit, and immediately write it off as a near-ghost town. But there’s one attraction here that actually draws a crowd. The Amargosa Opera House and Hotel is a performing arts center, out here in the middle of nowhere. The building was constructed in the 1920’s as part of a Borax company town, but it was in 1967 that Marta Beckett discovered it. She was in town to get a flat tire fixed, following a few days of camping in Death Valley. While there, she noticed the building, peeked through a hole in the wall, and discovered an abandoned, crumbling theater. She decided to rent the place, repair it, and hold performances several nights a week. And since there were times when no one was in attendance, she painted an audience on the walls. After a few years, the outside world discovered Marta and her lonely performances, and actual humans started showing up. Marta retired in 2012, but another performer, Jenna McClintock, took over the shows. You can still see them on Fridays, Saturdays, and Sundays, from November to May. You’ll have to check out the Opera House’s official webpage for a peek inside. The opera house was locked up during my visit. However, I have a feeling the murals in the theater look a lot like the paintings on the windows. It’s just a little bit creepy. The Opera House is at one end of the horseshoe-shaped complex. On the other side, you’ll find the only accommodations in Death Valley Junction, at the Amargosa Hotel. This part of the building was open during my visit. The lobby feels quite homey. It displays an interesting collection of items from the Opera House’s history. 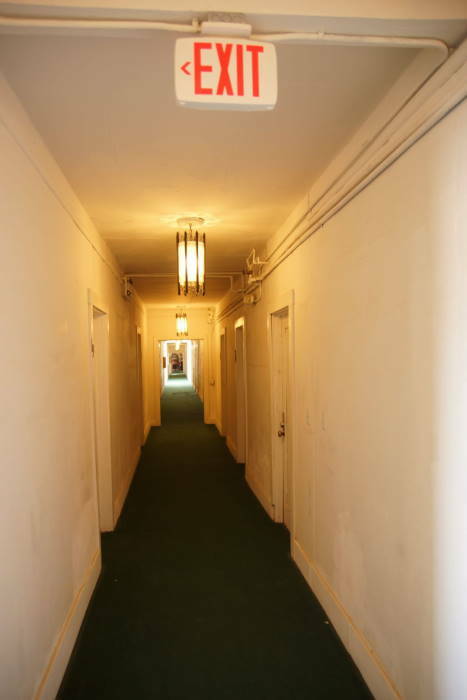 The hallway to the rooms, however, is very creepy. It’s also rumored to be haunted. I’d suggest you read some online reviews before booking a night here. 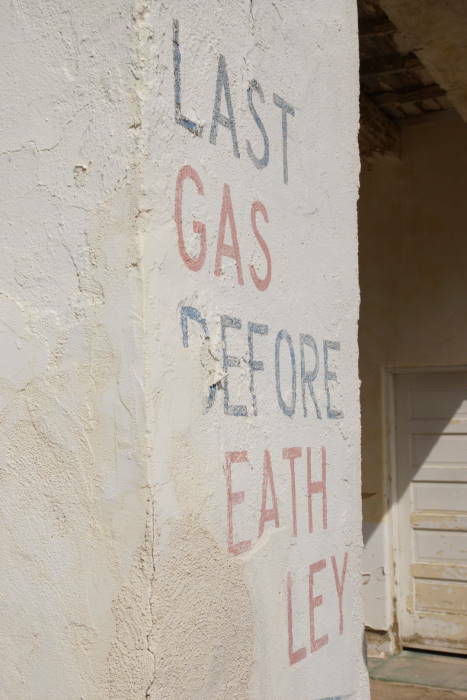 … that promises the last gas before Death Valley, but doesn’t deliver. 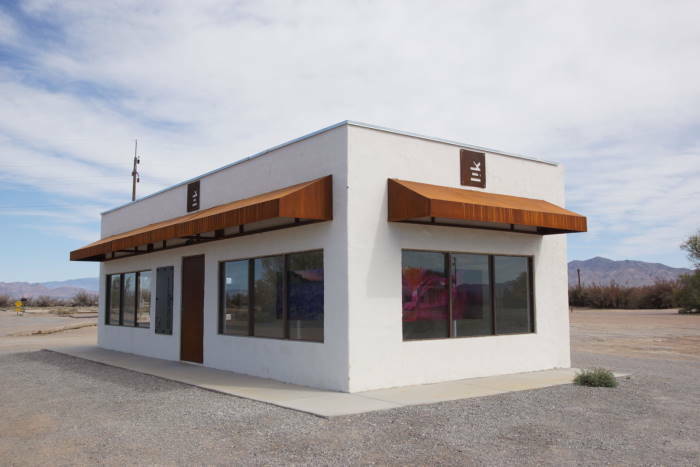 There’s also one very noticeable, very new building in Death Valley Junction, right at the intersection of the two highways. It’s an art gallery, that displays a few huge works of art by Peter Lik through the windows. However, the door was locked during my visit, and I’m not sure that it’s ever open. And once you reach the huge curve, you’re at the end of town. Next stop, Baker, California. You might want to plan your visit to Death Valley Junction around a performance at the Amargosa Opera House. Otherwise, this tiny town is worth just a brief stop.